At New College Library we’ve been busy cataloguing the TR Collection, one of the Funk Donation funded projects, and over 1500 items have been catalogued so far. Believed to have once been kept in the Tower Room at New College Library (which is the origin of the shelfmark) this collection contains many early and interesting items. We’ve chosen three of them to put on display in the New College Library Hall, and using our new Special Collections scanner to capture images from them. 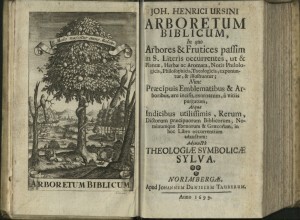 Ursin’s Arboretum Biblicum, a guide to trees in the Bible, is a richly illustrated early botanical work. 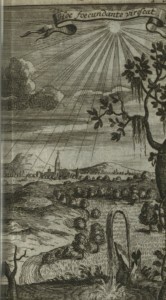 This work by Scottish Covenanters James Renwick and Alexander Shields is of particular interest because of its inscriptions. These indicate that it was gifted by Sir Walter Scott (1771 –1832) to Scottish antiquary and artist Charles Kirkpatrick Sharpe (1781?–1851) and later belonged to Adam C(leghorn) Welch. Professor Adam Cleghorn Welch (1864-1943) was a minister and Professor of Hebrew and Old Testament at New College.His portrait now hangs in the New College Library staff offices. Renwick, James (1662-1688) and Alexander Shields. 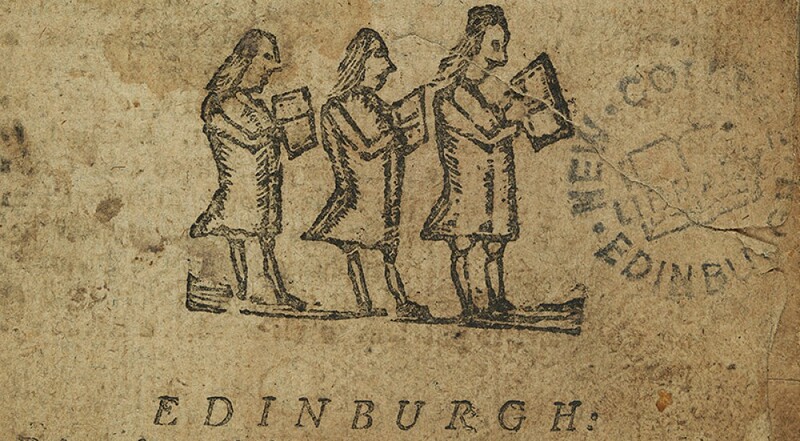 An informatory vindication … Edinburgh : s.n., 1707 New College Library TR.1026. The rather blood thirsty volume at TR.832/1 contains twenty-five engravings showing how Christians were tortured and killed in the early Church. This entry was posted in Library and tagged Funk, new college library, rare books, TR by cloverodgers. Bookmark the permalink.